Heat oven to 375°F. Spray 4 (4-oz) soufflé dishes with cooking spray. Separate dough into 8 biscuits. Cut each biscuit into 4 pieces. Roll into balls. Place melted butter in small bowl. In another small bowl, mix brown sugar, 1/3 cup cake mix, the cinnamon and sprinkles. Dip each ball of dough into melted butter, then roll in sugar mixture. Place 8 balls in each soufflé dish. Bake about 20 minutes or until puffed up and browning on edges. Meanwhile, in 2-quart saucepan, melt 1/4 cup butter over medium heat. Add milk, 1/2 cup cake mix and the granulated sugar. Mix with whisk to form thick glaze. Remove from heat. Cool 5 minutes. 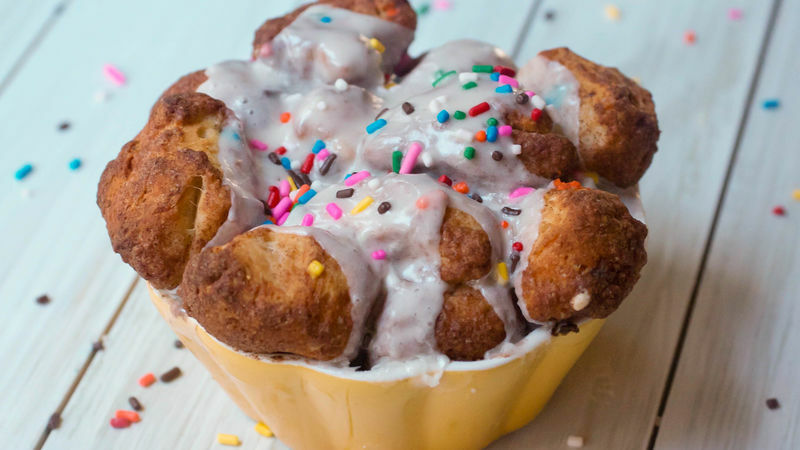 Spread on each monkey bread. Top with sprinkles. If glaze is too thick, add a few drops of milk to desired consistency. Make the monkey bread the night before, and reheat in the morning. Then glaze and finish with sprinkles.